The Technical Lead's job is a broad one. A wide set of practices and skills can help you meet your goals. In this set of posts I dive in to those I've found to be really valuable. It's not a checklist, they're a challenge. Grow an awareness of the width of practices that will aid you to build great software and great teams. To be a great Technical Lead you should have strong opinions on — and an appreciation of — these areas and practices. Having a wide set of skills creates choices and ways to stretch, making you and your team effective and accurate. 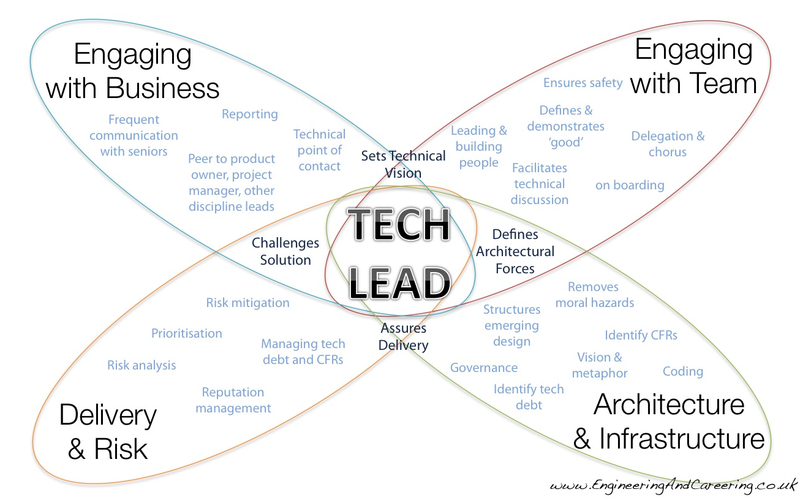 Is this model a specification for how a Tech Lead should be? There are many ways to be a successful Technical Lead. No list of practices could be definitive. These are the practices and behaviours I value most. Most important is how your skills contribute to the bigger picture of what a Tech Lead is doing. Use the model as a guide, and adapt. 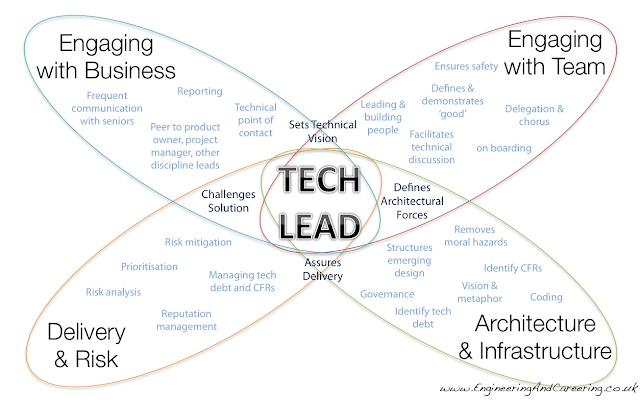 A Tech Lead has to adapt to their circumstances, their team's needs and the key goals. I keep a strong idea of what needs doing, but as long as I can be sure that a good enough job will be done, I'm flexible on the who does what. And the more mature the team, the more gets delegated and done in collaboration. Lao Tzu's guide: "When the effective leader is finished with his work, the people say it happened naturally" may not bring you glory but it might help you to keep doing what you love. Take time to grow into the role. Whilst all the practices here are valuable, you are not going to pick them all up in a week. If you are beginning your technical lead journey, take time to identify what's important right now. Engaging with the Business and the Team are the most social of the spaces. Interacting with the groups outside the team, reaching out in the wider business and validating what is being done. Sharing with peer and other teams involves mapping back needs to what you are doing. Engaging within team is creating core good practices and a healthy group of people. They are still technical. What we do always comes back to a technical delivery. The lower wings are the most technical: ensuring the group builds something valuable, timely and useful. They are still social - a Lead should be working with and through the team to get the results needed. Team based emergent design, exposing and managing risks, ensuring a good solution that suits the business all are a mix of technical vision and high communication and socialisation. This article's job is to get into the detail of the role as I see it. I couldn't quite leave it there. There is a heart to the role which needs calling out. Prioritisation and focus are critical. In the following sections I call out many important things to do and consider. 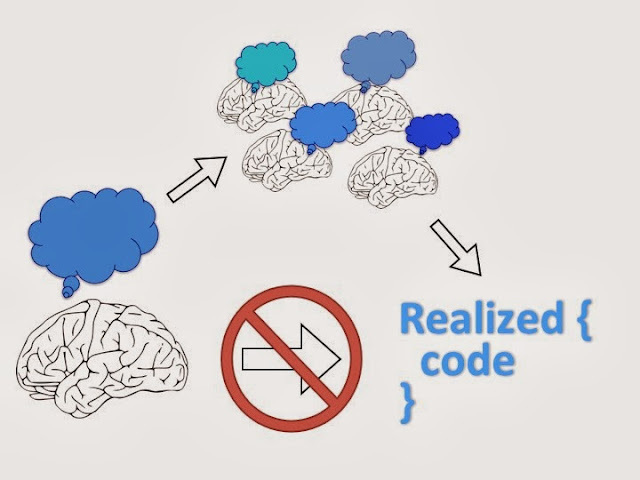 A big slice of leadership is spotting and doing The Important; sorting out the strategic and then getting out of the way so the team can get the job done (or better still, joining in with the coding). Crossing through almost every practise is communication. Clear, accurate, targeted, responsive. Getting heard and hearing others is no small thing. For some people it's natural, others have to work to get good. We'll all have times when it doesn't happen as we hoped, and we have to take a different tack and try again. I feel that there is huge value in getting good at this, and spend a lot of my time doing so. Self awareness and strength go hand in hand, supporting my communication. I try to be aware of my weaknesses, but know and use my strengths. Right at my core is passion and learning. I'm often opinionated, but I want discovery to drive what I do. I like to work out the simplest steps that will tell me the most and ask 'lets find out?' and 'what will teach us the most?' a lot. We all have our gaps, and our ways of working. What do you do differently? What don't I do that I should consider? What's at the heart of what you do?